Our first grade Fry words come color-coordinated in a pretty blue. The Fry list of the first 100 Fry words is actually meant to be divided into two parts. The first 50 words are recommended to have been learned in kindergarten, and the second 50 words in first grade. So by the end of first grade, all 100 words should be memorized. 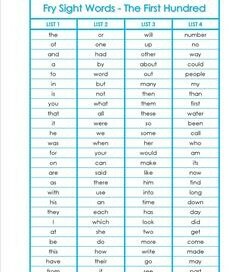 You will find a list of these words and an assessment sheet, too, to track your kids progress. 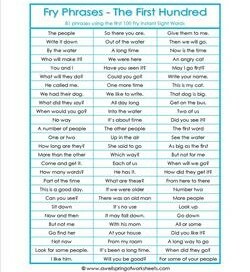 The first 100 Fry phrases (or short sentences) use the Fry words as we use them in our daily communications. 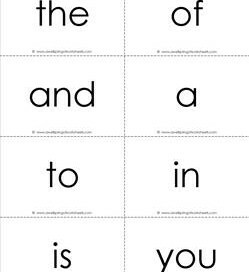 Go to this page to see more first grade sight word resources. This Fry list is of the first 100 fry words. They are appropriate for kinder to first grade children. 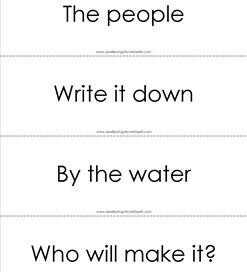 Divided into four lists with 25 words each, use the first 50 words for kindergarten. Fry sight word assessment sheet for the first 100 Fry words. A convenient check box is provided to mark the words that need more practice. Thirteen pages of Fry word flash cards – the first 100 – black and white. Eight words per page. Recommended for kinder and first. This set of Fry word flash cards – the first 100 – color has 14 pages, one cover page and 13 pages of flash cards. Eight words per page in bright blue. For K & 1st. 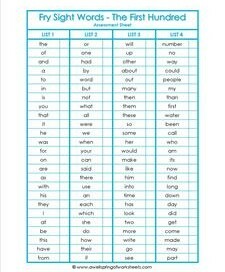 Fry Phrases – the First 100 lists 81 phrases or short sentences using the first 100 Fry sight words. 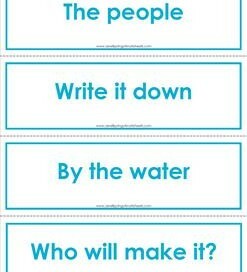 Examples are: You and I, up in the air, May I go first?, and Get on the bus. Fry phrases flash cards – the first 100 – black and white has 81 phrases, is 21 pages long, and has four phrases per page. For kinder and first. Fry phrases flash cards – the first 100 comes in bright blue, has 81 phrases, four phrases per page, and is 21 pages long. For kindergarten and first grade.